It's time to say good bye to dull skin! Luminous nighht cream will prevent youe skin without aging skin, wrinkles, and another skin problems. Containing immortal essential oil, avocado, and ETVC such as main ingredients, it will protect skin from many skin problems and helps the skin regeneration process when you sleep. Brighten your skin with radiant looks. Moisturize and balance your skin's PH. Maximize the process of collagen production effactively, so your skin will be look smoothies without wrinkles, dark spot, fine lines, dull skin, etc. Nourishing your skin maximally into the deepest layers, so skin cells regeneration process will be run perfectly. Soothing your skin to make your skin stay hydrated along the day. Hydrated your skin when you sleep, so it can't make your skin dry. Apply it evenly on face and neck. Gently press into the skin with your fingers until absorbed. 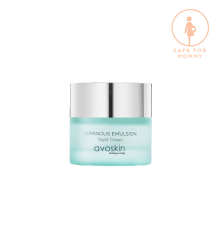 Using it every night after using Avoskin Perfect Hydrating Treatment Essence.